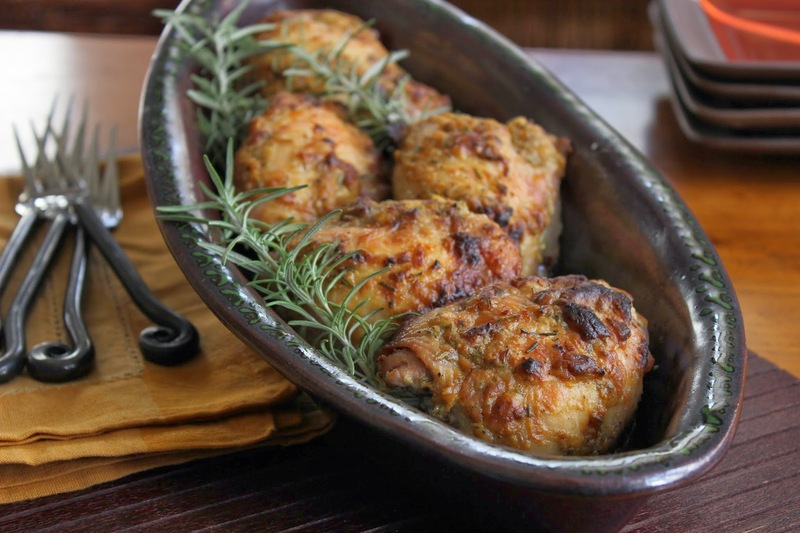 Everyone needs a few tried and true chicken recipes in their repertoire … the kind of recipes that only use a few staple ingredients and can be whipped up in a flash for a weeknight dinner. It was an idea that came about while we were looking through the pantry, trying to think of what to have for dinner (an all-too-common occurrence, but one that often meets with mixed results). I had a package of chicken thighs that needed to be used, but no time to marinate them as I normally would. So, I decided to rely on flavorful staples I had lying around -- a few tablespoons of mustard, fresh herbs and a bit of wine. I decided a bit of butter would keep the baked chicken moist, while ensuring a bit of caramelization on the exterior. And what started off as an impromptu experiment turned into one of the most delicious recipes I've come up with in a long time. These delicious chicken thighs are impressive enough to serve to impromptu guests, but they feel just as at home alongside a pile of fluffy mashed potatoes and green beans. Sometimes the best recipes come from those off the cuff ideas and last minute inspirations.